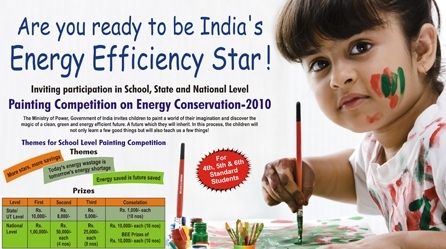 As part of the National Awareness Campaign on Energy Conservation 2010, the Ministry of Power has announced a painting competition for school students at the State as well as National level. Inviting school children studying in 4th , 5th & 6th standard, the competition is a step towards generating awareness among the children on the need to conserve energy and will indirectly involve their parents. The competition is being held at the School, State and National Level and has cash prizes worth Rs 33,000 per State/UT. The themes for the painting competition include the following – 1) More stars, more savings, 2) Today’s energy wastage is tomorrow’s energy shortage and 3) Energy saved is future saved. At the state level, the participating schools’ principals will select tw0 best paintings and send them along with information on number of students participated at the Nodal Official address of their respective State/UT by 12th October, 2010. The first, second and third prize winners from each State/UT will be invited to Delhi to participate in the National Level Painting competition of two hours duration on 12th December 2010. Out of these, the best paintings will be selected for First Prize (1 no) of Rs. 1, 00,000/-, Second Prize (4 nos) of Rs. 50,000/-, Third Prize (8 nos) of Rs. 25,000/- and consolation Prize (10 nos) of Rs. 10,000/- each. National level winners will be given the cash prizes on National Energy Conservation day, 14th December,2010 . The Ministry has announced to include CBSE schools located outside India as well. The paintings received from these schools will be considered under a separate category and the Certificate of Appreciation will be sent under the signature of Director General, Bureau of Energy Efficiency. It is requested that they send two best paintings directly with all requisite details at the Bureau of Energy Efficiency (BEE) office address at Sewa Bhawan, R.K.Puram, Sector-1, New Delhi-110066 (INDIA). The BEE Star Energy Efficiency Labels have been created to standardize the energy efficiency ratings of different electrical appliances and indicate energy consumption under standard test conditions. The BEE Star Labels include a Star Rating System that ranges from One Star (least energy efficient, thus least money saved) to Five Stars (most energy efficient, thus most money saved). y dont u conduct for higher class chidren.so that even they get a chance to proove themselves and to convey there ideas.